Nowadays, aging infrastructure in the developed world has increased the need for in-depth analyses of existing structures, both for replacement and retrofit. Using a comprehensive and reliable analysis tool is the key factor in understanding the behavior of existing structures and in developing the best retrofit designs. ADINA is widely used in the construction industry all around the globe. In this Brief, we present a study that demonstrates an interesting application of ADINA in the analyses of railway bridges. 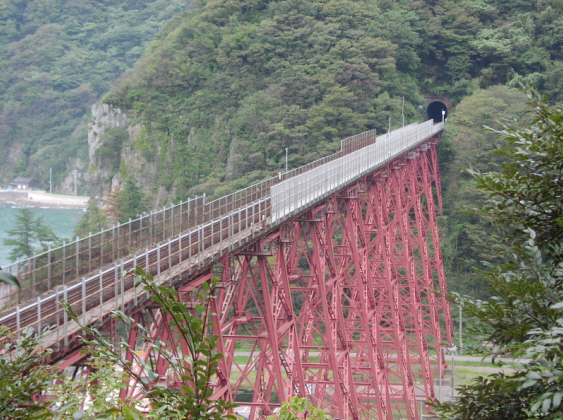 The Amarube Railway Bridge (Figure 1), one of the Japanese legacy steel bridges, was replaced by a new prestressed concrete bridge in 2010. In the replacement process (conducted by Shimizu Corporation), a prestressed concrete girder of 93-meter length and 3820-ton weight was moved with slow sliding on the support structures to be adjusted to the tunnel entrance (Figure 1). The sliding process consisted of 2 stages; in stage 1, the girder was subjected to 4-meter sliding in the normal direction to the railway axis, and in stage 2, it was subjected to a 5-degree rotational sliding about the axis of the bridge column (see the movie above). To study the behavior of the frictional sliding for the positioning of the bridge girder, finite element analyses were performed using ADINA. Figure 2 shows the finite element model. All of the concrete members were modeled using 3D solid elements, the steel members were modeled using beam elements, and the tow cables were modeled using truss elements. Frictional contact conditions were considered on the bottom surface of the bridge girder and on the top surfaces of the columns.